After a slow start, the Boone Central/Newman Grove Cardinals evened their early-season basketball record at 2-2, scoring a road victory at Central City Thursday and nipping Mid-State Conference rival Pierce Friday in Albion. Boone Central/Newman Grove now enters a hectic pre-holiday stretch. The Cards hosted Twin River at Newman Grove Tuesday, will entertain Norfolk Catholic Friday, and travel to West Holt Saturday and Minden Monday. It’s always a relief to get the season’s first victory under your belt. Boone Central/Newman Grove got that accomplished Thursday at Central City as a 24-8 second-quarter blitz keyed a 67-47 win. Trailing 18-16 after a high-scoring opening period, the Cardinals harassed the host Bison with fullcourt defensive pressure in the second stanza and broke the game open as junior Derek Gentrup exploded for 15 points. When the Cardinals and Bluejays battle, everyone knows they will witness a defensive donnybrook. 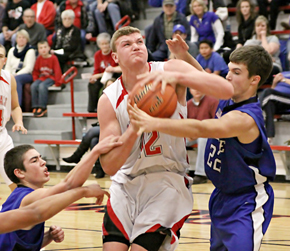 This past Friday was no exception, with host Boone Central/Newman Grove holding on to edge Pierce 46-44 in Albion. BC/NG got off to a strong start, building an early 15-9 lead on the strength of Hedlund’s 10 first-quarter points, and led 28-21 at halftime. Hedlund poured in nine more points as the Cardinal lead grew to 43-30, but BC/NG scored just three points in the final period as Pierce made a spirited charge behind Lane Rohrich’s three-point marksmanship.